It was a delightful and sunny saturday, just right for an outing in the desert. After all it is not every day one gets a chance to witness a sport or an event that is so traditionally Middle Eastern and inextricably linked with the heritage of the Arabian Peninsula. When we read about the camel race that was to be held on 14 December, we decided to go and be part of the excitement. This was not the first time we went to witness a camel race. We have visited it several times and each time we experience the same zeal and enthusiasm. At present the Kuwait Camel Racing Club, the only official camel racing club operating under the aegis of the Youth & Sports Foundation, organizes local events and participates in international races elsewhere in the Middle East. Last year we were lucky (thanks to my hubby Jeet who always takes the initiative) to be part of the huge crowd who were there as spectators at the 12th Annual International Camel Race which was held in Kuwait Camel Racing Club(12 Feb-16Feb'2012). It had around 500 participants where robots were the jockeys. The tiny ''riders'' powered by remote control as the camels' owners’ race alongside in their jeeps or SUV's. The robot jockeys are complete with little jockey outfits and hats, and their remote controlled whips slap away at the camels as the owners pursued one of 65 Toyota Land Cruiser prizes. The 6km race was part of a five-day tournament that had around 500 participants. As you enter the club, you will see photographs of past competitions on the walls. The clubhouse is a big air-conditioned structure with comfortable seating facilities. As we approached the club we saw lot of vehicles parked outside and knew that our information about the race is correct. As we entered the club we saw lot of Kuwaitis most of them owners of the racing camels and their relatives had already taken their seats. Also lots of western expats were present. The race which started at a distance of six kilometers, concluded in front of the clubhouse. One could watch the start of the race and follow it up on television monitors placed inside the clubhouse. We were seated in the club house but as the race started, hearing the vivacious and ebullient commentary we went near the track to cheer and capture the race. The race we witnessed last Saturday was a local event but had the same fervor and passion. It was a 6km race and camels took nearly 10 minutes to complete. Two-three races are held in one day. 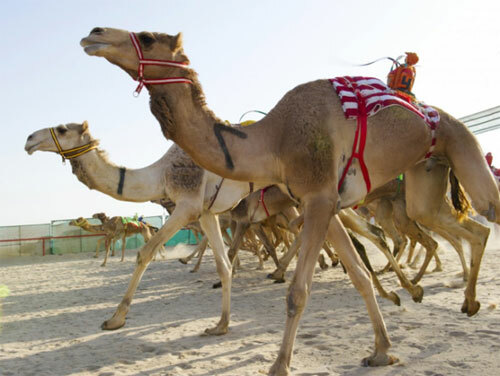 The camel racing season begins at the end of October and continues till the end of April. It may start even later or end early if it is still hot. The season is flexible depending on the weather. It is open to the public and there is no entrance fee. There are races on Saturdays which starts at around 2pm in the afternoon. The numbers of races differ from week to week. The track is oval with a road running alongside the track. As the camels race, they are flanked by all sorts of vehicles racing alongside on the dirt road paralleling the race track. From the stands as the camels round the final turn you see this wild melee of vehicles racing ahead to position themselves at the finish line to watch their favorite cross the line. And so we saw the camels racing towards the finish line with their owners in hot pursuit on four wheels, with the robotic jockeys cracking their whips in the last leg of the race, making a whirring sound that can be heard from the side of the race track. One can get up close for the start or the finish of the race or watch it on TV from the stadium. As the stampede of camels and SUVs approached the finish line we started snapping as much pictures as possible. A short distance away others were enjoying a free ride on camels, which we were informed that they were racing camels that were too old to join the sport, but were now used for showing. The camels wore fantastically colorful Arabian style outfits which added sparkle to the event. It was a delightful experience. Every year we have been visiting alone (because with small kids we don’t plan much ahead and decide on the spur of the moment) but this year few friends accompanied us. You haven't really experienced life in the Middle East unless you have gone to the camel races. So this winter plan to visit the Kuwait Camel Racing Club and experience the original and traditional past time of Kuwait. Parimita Barooah Bora is a onetime lecturer and currently she is a stay-at-home mom. Having done her post graduation in English, Education and Travel n Tourism, she taught for few years until her relocation to Kuwait. She likes to share the experiences of her life as a freelance contributor to various newspapers, magazines and websites. Now, as a freelance writer and teaching children in the evenings at home keeps her busy. Member of IWIK Team.